"In the final hours before voting ends in New Hampshire, public polling has consistently shown 2 things: On the Democratic side, @berniesanders leads @hillaryclinton; and on the Republican side, @realdonaldtrump is well ahead, but not complacent. For the first time, #DonaldTrump — who seemed to be feeling the rigors of the campaign trail over the weekend — is holding his first 4-event day today. 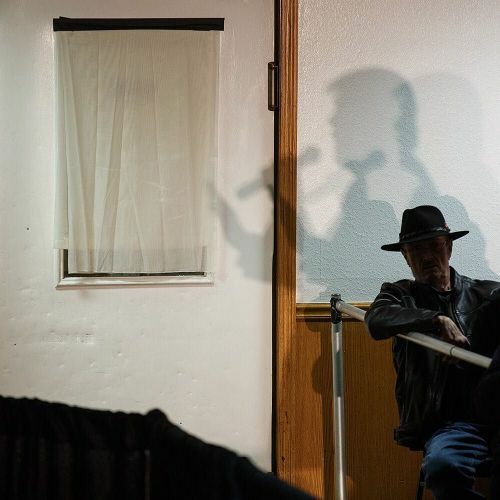 @damonwinter photographed the candidate's shadow as he spoke at a town-hall-style campaign event in Salem, #NewHampshire earlier today." By nytimes on Instagram.